Oh the joys of Spring … new plants peeking up after a long hibernation, the sun warming my face and shoulders as I work outside, and … spring cleaning! I tend to get really excited about the first two… not so much the cleaning part! As the sun has made a glorious appearance the last few days here in the Pacific Northwest, I’ve been planting new color spots in my yard and sprucing up the deck and BBQ. Now, I don’t get the fresh little plant seedlings and sun in my bead studio but Spring has definitely arrived there too! Over the winter, I collect new gemstones and new findings (all the little stuff that goes into making each piece of jewelry) and Spring is when I pull it all out and get started making fresh new designs. Since all of the new items have been stashed and stored away, it really feels like a whole new season in my studio! One of the newest gemstones I’ve been working with is Russian Amazonite. 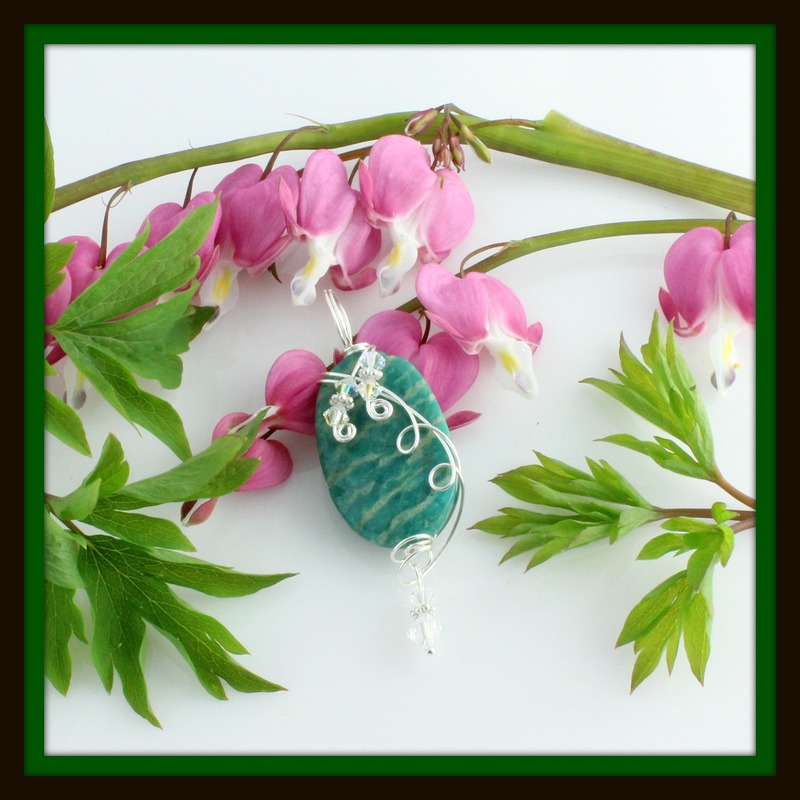 This is an opaque stone with streaks of milky white set in a stunning blue/green. Truly a beautiful stone and the color really sets this one apart! Amazonite is named after the Amazon area in Brazil, where it was originally discovered. It’s also found in Norway, Canada, Russia and India to name a few. It’s color can range from light green to dark, depending on which location it’s mined from. Amazonite is sensitive to many jewelry cleaning techniques like heat, acid, abrasives and harsh chemicals. It’s recommended to use a mild soap with room temperature water and a soft cloth to clean this stone so as not to diminish the natural luster. I have a very limited supply of the gorgeous stone and it’s making it’s debut at the market this weekend! If you’re in the area, come on down and check this one out!